The Lafayette Digital Hand Dynamometer is designed with the same weight and form factor as all our other Hand Dynamometers. Isometric grip force is scored with ±1% accuracy from 0-250 lbs (113 kg, 1112 N). The Digital Hand Dynamometer has a battery life of 10 hours and can retain up to 250 tests in its data stores or be combined with the Lafayette LEval App to create a database of test scores for storage and generating normative data. 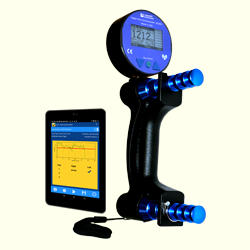 Designed for use with compatible Lafayette Instrument Company Evaluation systems, such as the Jackson Strength Evaluation System, Digital Hand Dynamometer, and the VertiMetric Jump Assessment System, LEval provides a wireless connection between a device and a tablet.